Hi everyone! My name is Abbey and I am the creator of the Instagram blog, Fab Rehab. My goal is to inspire all types of women to express themselves through fashion and beauty, both inner and outer. I started my blog almost two years ago but its had a makeover since then and I have made the decision to share it with the world. I have big things planned for my blog, so follow me as I continue to grow through this industry here. 2015 has been filled with chic fall trends. Everything from camel suede, to ribbed fabric, I’m loving the fashion the season is bringing. One trend I plan on rocking all throughout winter is faux fur. This look is the least bold of them all. If you don’t feel comfortable wearing faux fur in your wardrobe or want to start out simple, rock it in your accessories! This adorable fur keychain has been my obsession lately. Colored fur is really popular this year, so this pink puff is perfect for adding a pop of color to any outfit, not to mention it’s super cute! I paired the funky accessory with my cross body bag to add a fun twist to my 1970’s inspired outfit. This look is a little bolder, but nothing you can’t handle. 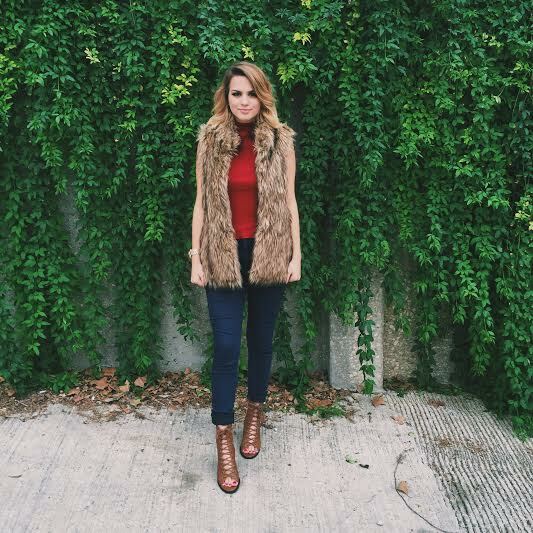 This faux fur scarf is my go-to piece during cold winter days. Not only is it super cozy and warm, but its also a great way to add some personality to any outfit. Its easy to get into the sweater, jeans, boots, routine during the colder months. Throw on this scarf to your winter look to make it more interesting! 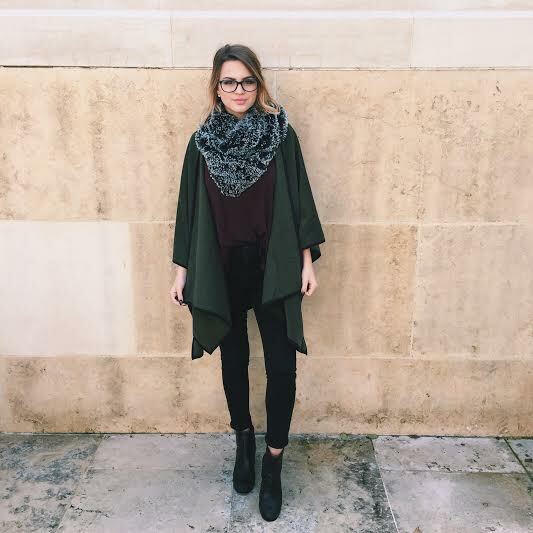 I love how the black and gray tones in my scarf made my hunter green poncho pop. I mean who doesn’t love a good chunky scarf right? Why not make it furry! Now we’re getting into the bolder pieces. This faux fur vest was one of my favorite fall/winter items last year, and I definitely plan on showing it off some more this season. The fact that it is a vest makes it a little easier to style because it allows most of your shirt to show, balancing out bold with basic. Since this particular vest is a little on the longer side, I chose to pair it with a cropped turtle neck, high waisted jeans, and healed booties. This ensures that my figure is not lost under all the fur. This look is for my more daring girls. Now this is what I call a fashion statement! 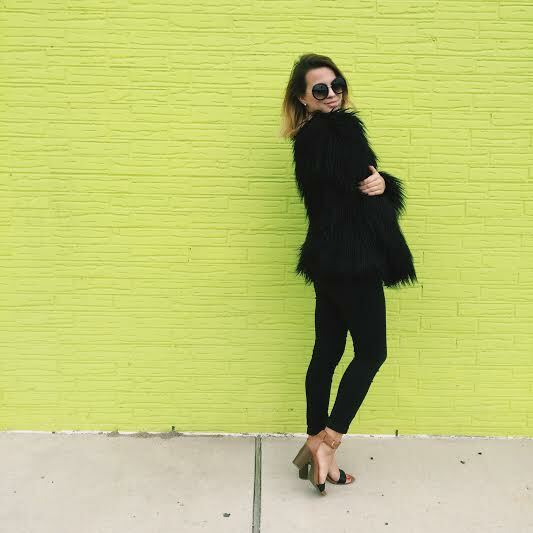 This playful yet chic faux fur coat is one of my favorite pieces in my closet. Its so fashion forward and instantly makes me feel like a rich upper east sider. This look is understandably intimidating to most people, but paring it with a monochrome outfit and feminine accessories like my strappy heels tone down this bold piece. P.S. Huge thank you to Kaci for inviting me as her guest writer for November. Make sure to subscribe for her monthly newsletter! I was wondering if my faux fur vest was still in style. This is great! I love the scarf it's playful but also looks incredibly warm. Right! It's so cute! 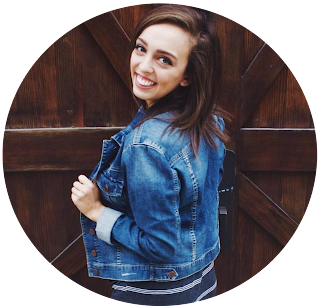 Make sure you follow Abbey on her Instagram blog! She posts so much cute and fashionable content! Very cute! Can't wait to see more.